While on dual-role patrol and exploration aboard the blue-canvased Elisabeth an uncommon encounter occurs. A crew member calls out a sighting: "Ship turning towards, brig! Looks like friendly colors." Its the Olivia! But the crew's delight is quickly dampened when the Olivia's captain informs them of the reason for this meeting. The Marianne has been stolen by pirates and the navy has tasked the Elisabeth with taking her back. Although the captain of the Olivia has been tasked with delivering the message of this mission they were given the option and discretion to choose whether to aid in this objective which the Olivia offers without hesitation. The crew of the Elisabeth graciously accepts. The Olivia is an older and smaller ship, her hull somewhat weathered by her time at sea and flying plain sails but she nevertheless has a mythical quality among the navy as one of the most reliable and among some one of the more surprisingly lucky ships. One time she and her crew were ambushed by three schooners and not only did she survive and defeat her foes but she also managed to salvage one of the ships and rescued a number of enemy sailors from the unforgiving sea. The crew of the Elisabeth is honored by her offer of support and elated to sail with her and so the two ships set out together in search of the Marianne. The Marianne is one of the newest ships sailing. She's been at sea less than a year and yet has now been stolen by privateers. One of the larger ships sailing these seas, indeed she is larger in every dimension than the Elisabeth with more firepower to boot, but that size and strength comes at the cost of speed and maneuverability. Still, she is quite a sight to see. Less than a day later the Elisabeth and Olivia spot the Marianne thanks in large part to their familiarity with these waters, just as she passes by the Banana Archipelago. With their objective in sight and the advantage of windward they give chase! The pirate crew of the Marianne, slightly shorthanded for such a large ship and now well aware of their pursuers, scramble to get every last bit of speed out of her. 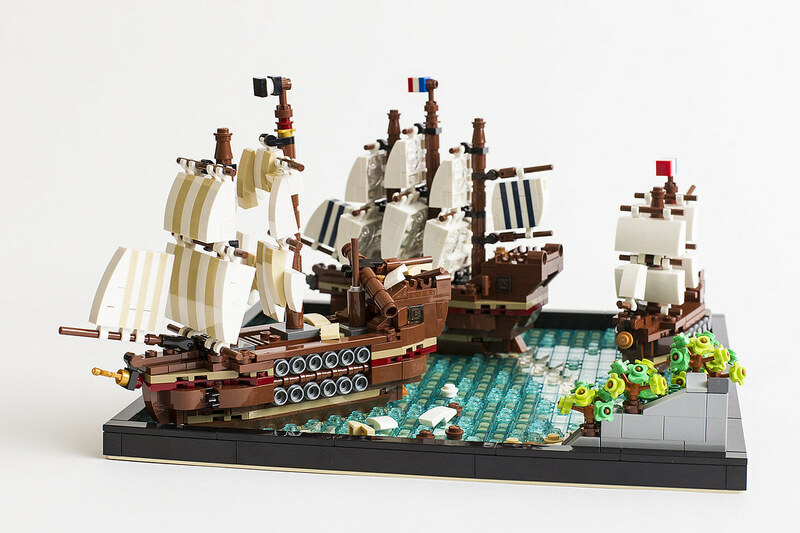 The crews of the Elisabeth and Olivia are incensed to see such a majestic ship flying under the depravity of the pirate flag. They begin to formulate their plan. They know the pirates won't give up without a fight and yet the pirates are fleeing as fast as they can towards privateer-dominated waters where they may have more of an advantage. And the pirates know they aren't going to be able to outrun their pursuers and also probably won't get out of this situation without shots being fired. 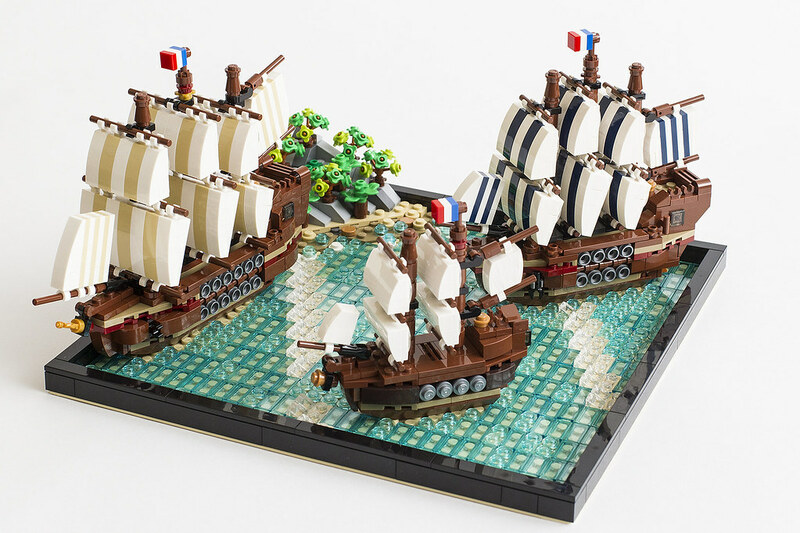 As they bear down on the Marianne and pirate-infested waters they realize they may only get one chance to take this ship with as little damage and further loss of naval vessels as possible. They do not want to sink this beautiful ship or go down in the attempt of recovery themselves. The Elisabeth signals to the Olivia their plan. The captain of the Elisabeth orders the port cannons loaded with chain and bar shot and the starboard guns with round shot, just in case. The Olivia takes up a windward flanking position as backup. The crew begins timing the waves as the Elisabeth closes fast. The less experienced pirates onboard the Marianne realize what's about to happen too late: "raking fire! Brace!" The Elisabeth turns hard, the wave comes and with ship heeled and guns aimed skyward the order is given: "FIRE!". Chain and bar shot crack through the air ripping and shredding rigging and sail. Several of the shots are too good and the mizzen mast is sawed off halfway up. Mast and yards come crashing down onto the Marianne's quarterdeck. The pirate crew is in a moment of shock. The captain, navigator and quartermaster are all hit or pinned beneath splintered wood. Some of the pirates return fire with muskets to no effect as the Elisabeth and Olivia stay off the Marianne's cannon broadsides. The pirates begin to panic and argue as they try to maintain control of the ship: "Who's in charge, how do we steer, how do we sail?". 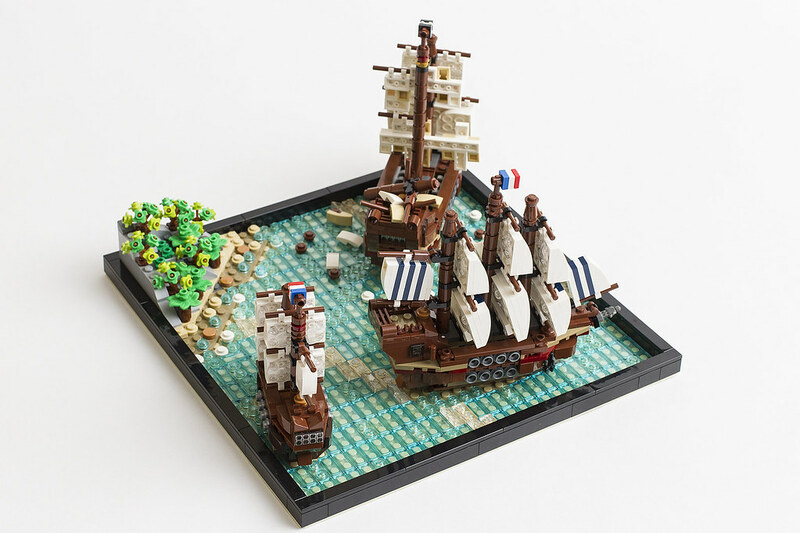 Some of the pirates realizing their impending fate leap into the sea and begin swimming to the nearby islands hoping their enemies are more interested in the ship than prisoners. In short order the remaining pirates realize its hopeless. If they try and continue fighting they'll surly be facing a slaughter. They accept their fate, lay down their arms and surrender. The Elisabeth and Olivia are victorious, they have taken back the Marianne. They now prepare to detain the pirates, fix what they can and limp the recovered ship back home. 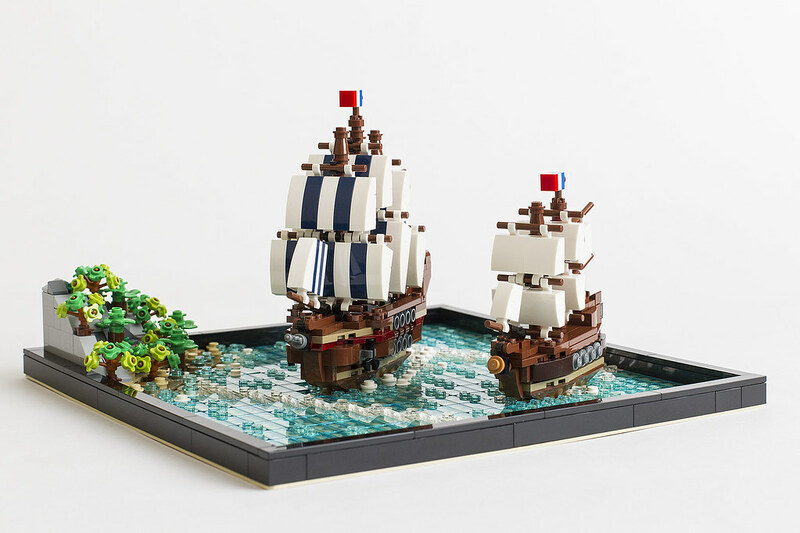 Beautiful micro ships and nicely written story! The details at this small scale are just so good! Nicely built water and islands as well. All around stunning! I wish I had these to display! Thanks! I'm glad you like the whole scene. Didn't quite get my fill of mini ships from the last build and wanted to continue and make a small fleet. 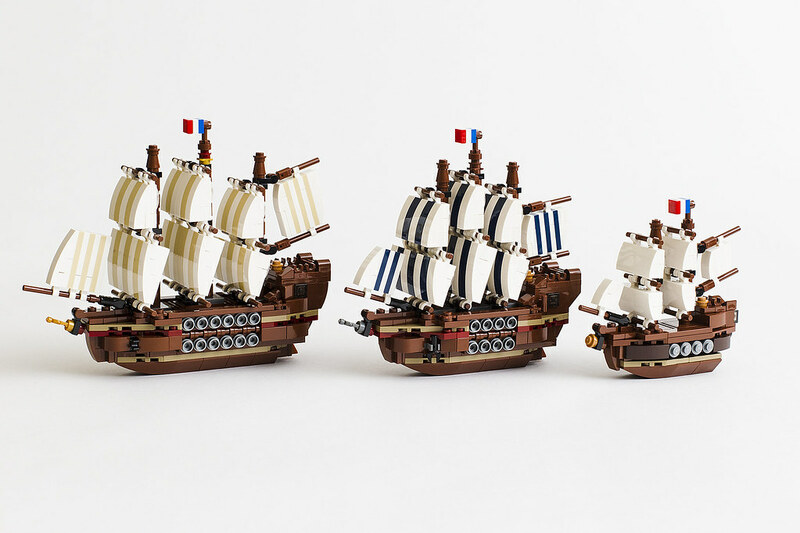 Would really like to do one more in a 3-deck man-o-war style and would also like to make the brig's masts as strong as the other two ships as the connection method for those doesn't work on the smaller ship and so the brig is a tad fragile. But I digress, thanks! Your very welcome! Can't wait to see what you come up with next! It's one thing to make these little "microships," but its another to equip them with a vivid little story. Any chance on say, "microforts" to come? Thanks a lot Jakbar! I was going to put the islands off the vignette (like the ships in the pursuit picture) but thought they looked better with the water so glad they look like they could be in the distance. Just felt it could use some scenery other than open ocean. Thanks! Thanks very much Ianmac! I was planning on making a dock scene with at a new ship being built partially constructed and a village but forts would be even better. Thanks for the idea! Maybe a fort with a small port town and dock, or multiple forts and another age of sail battle story. Thanks! An intriguing story that drew me into the builds. The ships are really well done, too. Very clean and they have a nice shape. But my favorite part has to be the presentation where you show the ships breaking out of and into the various vigs. That is really clever. Agreed - the ships are absolutely stunning but it's the presentation that really puts it over the edge for me! 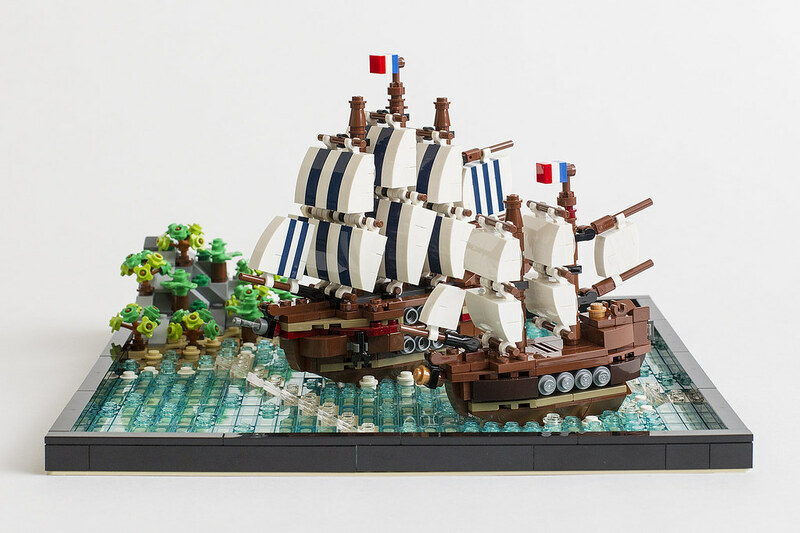 I've always been a fan of those who build nice little borders for their MOCs, but then using them to add a kinetic feel to the build (aka the ships literally bursting "out of the scene") is inventive and very fun. Great build. The micro's are very nice done and recognisable! 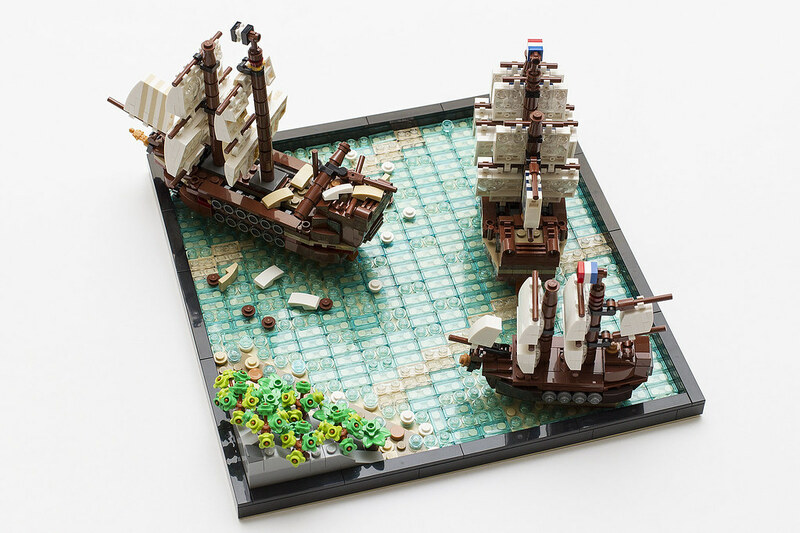 Very nice micro ships! You pulled out quite a lot of details... The use of the micro/nano-fig is really nice and the new leaf piece works surprisingly well as a tree! And top notch photography as always! My favorite part is the presentation: it's just - I'm searching for the right word- wonderful, incredible, unbelievable, jaw-dropping!!! Especially that idea of broken borders with water flowed out is really genius! I'm out of words!!! Sorry for being over-excited, I couldn't help. 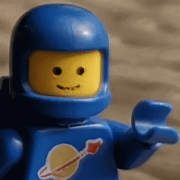 Now I'll know that it's definitely worth to check out also your other MOCs, not only modulars! Great work on the shape of the ships and the sails. So I've been thinking about buying the ship in a bottle set, but I have to say I'm not all that impressed by the ship itself. Would you happen to know if any of these ships would also fit into the bottle from that set? Its a great set even with the really tiny ship. 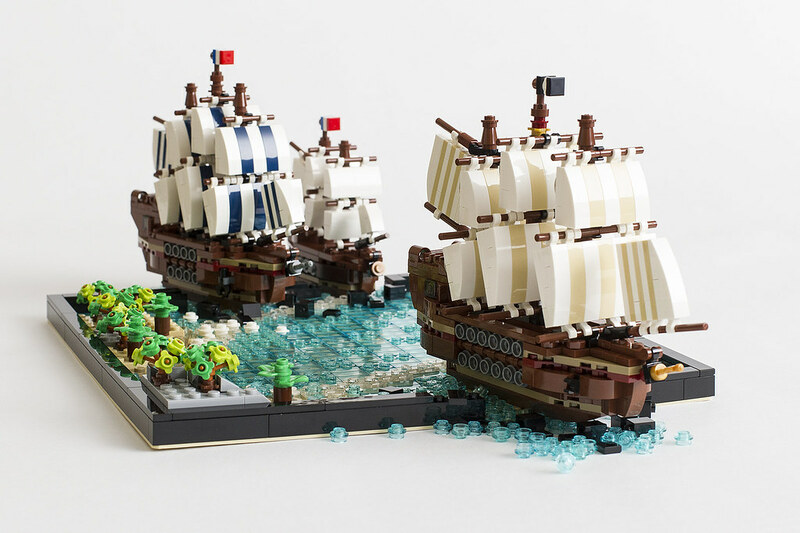 The Ship in a Bottle was one of two similarly timed sets that made me want to make my own tiny ships. That said I can understand some not loving the ship build but its still a very fun build and makes awesome use of SNOT. 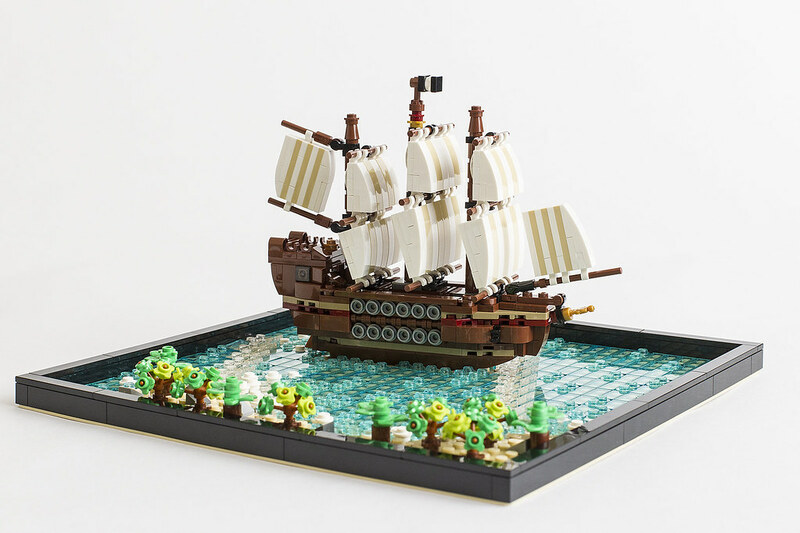 The only ship from this group that would fit in the bottle would be the little brig if you removed the flag and the 1x1 round plate at the top of the foremast. If you tilted the bottle on its edge you could probably fit it with the flag. The other two ships won't fit without making the bottle bigger in addition to probably needing to tilt the bottle (like it was in the Ideas submission) or shortening the masts or hull (could make it look like it was heavily loaded with cargo). If you want I can try fitting the brig in the bottle and taking some pictures this weekend. Thanks Captain Genaro. Had to workaround dealing with only 32x32 baseplates and very limited pieces to make up water. Could you? Along that line of questioning, is it possible to tilt the bottle and still have it sit correctly in the stand, or would the stand need to be modified in some way? Also, when you say "making the bottle bigger", do you mean that it needs to be longer in order to accommodate one of the larger ships? What I'm forming in my head is borrowing ideas from one of your larger ships (kind of an ironic statement), but chopping a gun deck so it's more of a frigate than a ship of the line. I suppose I should just buy the set and then figure things out for myself, huh? The length of the bottle is fine even for the longest ship. When I say make the bottle bigger I mean increasing the volume irrespective of the length (so basically a 'fatter' bottle). 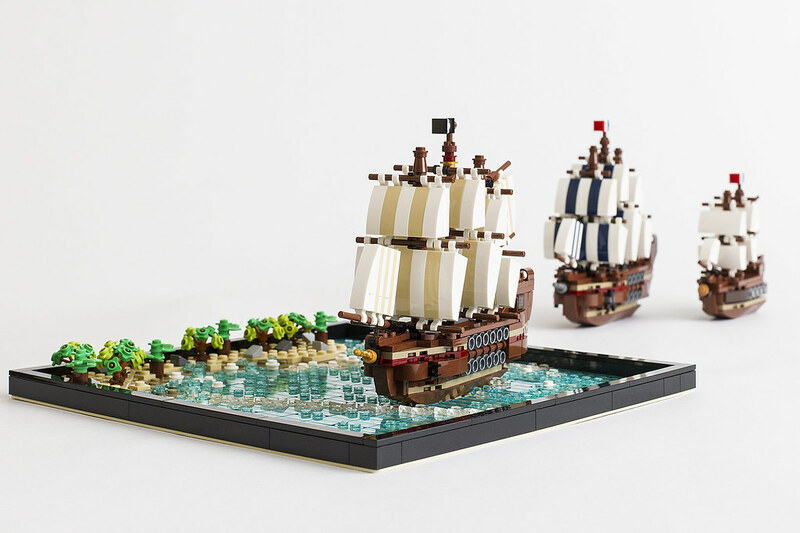 The original ideas submission is 6-studs wide on each 'wall' of the bottle between the curved trans-clear wall pieces which allowed for a larger ship (in addition to the bottle being tilted). The official set is 4-studs between the curve pieces and set flat on the display. So to fit these taller ships you'd need to increase the girth of the bottle to be more in line with the original submission and probably also tilt it. At least one other member has enlarged their bottle like this but the unfortunate outcome is that it renders the bottle a bit unrealistic and out of scale to the average bottle that the typical ships in bottles would typically be made in. 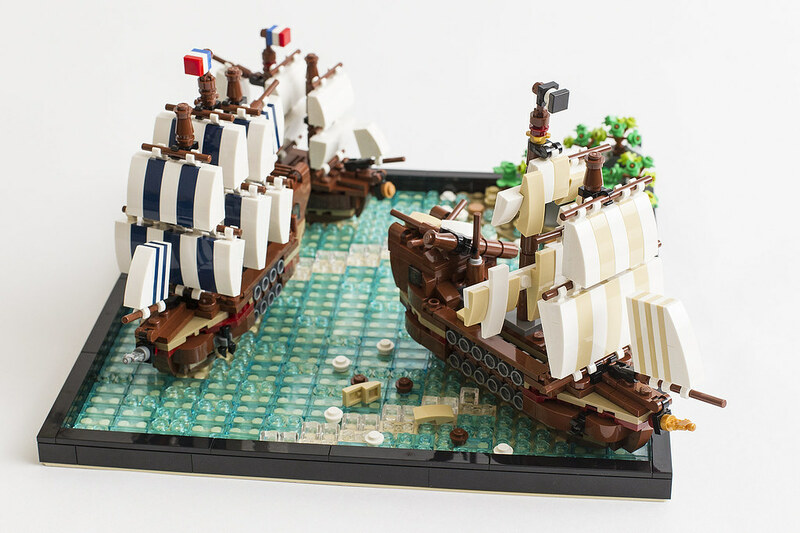 That's why Lego went with a more realistically scaled bottle for the overall ship in a bottle display piece as opposed to focusing on a more detailed ship and scaling a bottle around it. And in order to tilt the bottle you would not only have to modify the stand but also come up with a way to mount the ship inside while still maintaining the glass bottle look unless you're alright with having the ship loose. Chopping a gun deck and lowering the visible hull height would certainly be the easiest way to go and the set comes with studs for 'water' so it that would work quite well aesthetically. Everything's just right, I love it. 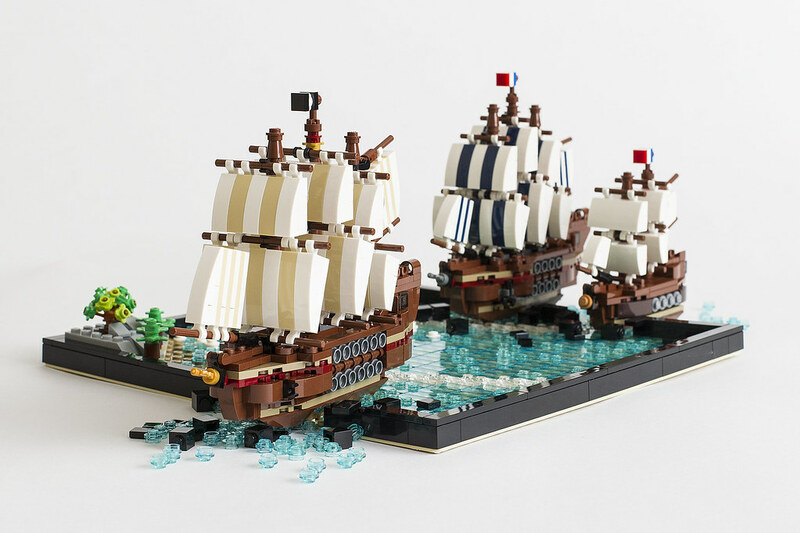 The ships are a lot nicer than the one in the official boat in a bottle set, IMO.